>AWESOME WEST GULF COAST VIEWS OF DESTIN SUNSETS FROM THIS TOP FLOOR UNIT. >TWO BEDROOMS/2 BATHS, SLEEPS 6. >2 POOLS...1 HEATED IN COOLER MONTHS, HOT TUB. >GATED PRIVATE ENTRANCE, SOME COVERED PARKING. DON'T HAVE TO CROSS THE STREET TO GO TO BEACH. It was very nice and peaceful. The condo was clean and met our needs. Great views! We had a grand time. The facilities at the property was top notch. We had a lovely beach vacation. Condo had a great view and the weather was perfect. We enjoyed the beach setup with the umbrella and chairs. The Surf Hut Restaurant was right next door and we could access it from the beach. Great seafood. Can't wait to enjoy Destin again. Thanks for the great review. Glad you had a good trip hope you'll return. Thanks for taking the time to leave the review. Great Place to stay while in Destin ! Not too crowded, yet close to everything! Thank you Justin for the review, sorry I'm late getting this back to you. Hope you return. Iappreciate you renting from me. The Crescent resort is beautiful and well maintained. The condo was very clean and newly remodeled with a great view, Housekeeping did not leave linens for the sofa bed but brought them when called, We really enjoyed the stay, it would be great if Southern Rentals offered the free movie rental that resort quest renters have access to at the resort. Thank you. Glad you had a great trip and Southern took care of the issue. The movies are an added benefit but it certainly raises the rental rates. Included are the 2 beach chairs and umbrella which saves another $150-$200/week. This beautiful condo has everything your looking for! This condo has it all. Beautiful views from multiple glass sliding doors. Master bedroom mattress was very comfortable. All new appliances. The grounds and pool area were so beautiful and clean. The ocean was literally steps away. The free daily beach service was great. I didn't have to bring my beach chairs from home and carry them out each day as in other resorts we have stayed previously. My husband and I had a wonderful stay and will definitely stay here again. The owner of the unit is very pleasant to work with. The location was great as well. The unit was also very clean and nicely decorated. Parking area is very close to elevator which made it very convenient to come and go easily. There is a newer Winn Dixie grocery store right across the street. It is worth checking out. This store has lots of delicious ready made food items that were delicious. This condo also close to scenic 30-A. What a beautiful drive. I just can't say enough about this wonderful condo. Hope you enjoy your visit to this beautiful area as much as my husband and I did. 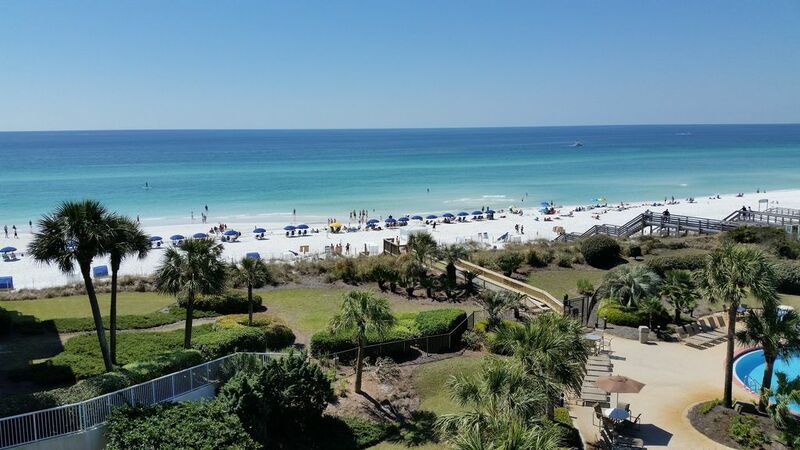 We will definitely be back to enjoy the beautiful Destin area and this relaxing condo at the Cresent complex again. This is our 2nd time staying in this awesome condo on the 4th floor of the Crescent, Miramar Beach in Destin. Fantastic location directly on the gulf with amazing views. This is such a convenient location with a variety of dining options, groceries, shopping, children activities, etc. The condo itself is outstanding....beautiful, modern decor, new kitchen appliances, excellent furniture, washer/dryer, flat screen TV's, etc. The Crescent is a very desirable complex with one of the best pool areas we've seen in Destin (been to a variety of properties over the years), exercise room, video rooms, etc. Excellent security to include gated parking and security to pool area. Once you book via the on line portal for VRBO and pay by on line booking with your credit card I will process this thru my local rental management company, Southern Resorts. Once full payment is received thru VRBO online payments, Southern Resorts will send you check in information 1-2 weeks before you arrive. They will be available to assist if you have any issues during your stay.They'll send you info regarding the gate codes/door codes/beach chair info WiFi password etc. in a prearrival email and you will not need to go to their office as the door code will be in the email.